Producing a ward newsletter can feel like a daunting amount of work. But it’s a great way of providing your patients, staff and friends and family with up-to-date information, creating a sense of community, involvement and inclusion and having fun. Newsletters can also be creative, showcasing patient artwork, poetry and short stories. They help use skills your patients have and provide a positive focus and conversation starter. Anyone who has seen more than one Star Wards newsletter will know that we’ve tried out lots of different formats! We’ve finally (or finally for now!) settled on not using a ‘proper’ newsletter template (Marion couldn’t get to grips with the columns business) and it’s basically just a Word doc with photos and a mildly designed front page. And indeed, back in the day, our early newsletters were totally undesigned Word docs. Our view is that it’s best not to get bogged down or even paralysed by design issues. The main thing is to get the contents out there. As you can see from the somewhat unedifying selection of morphing newsletter design, the only constants are Buddy and getting the newsletter produced. We strongly recommend both!! Include a balance of text and images. Use different coloured text and fonts. Utilise clipart, photos and illustrations. Always keep your patients in mind. Make sure your content is fit for purpose and appropriate. Choose your content. Including a variety of topics and sections will make your newsletter more interesting to a wider variety of readers. Ask questions. 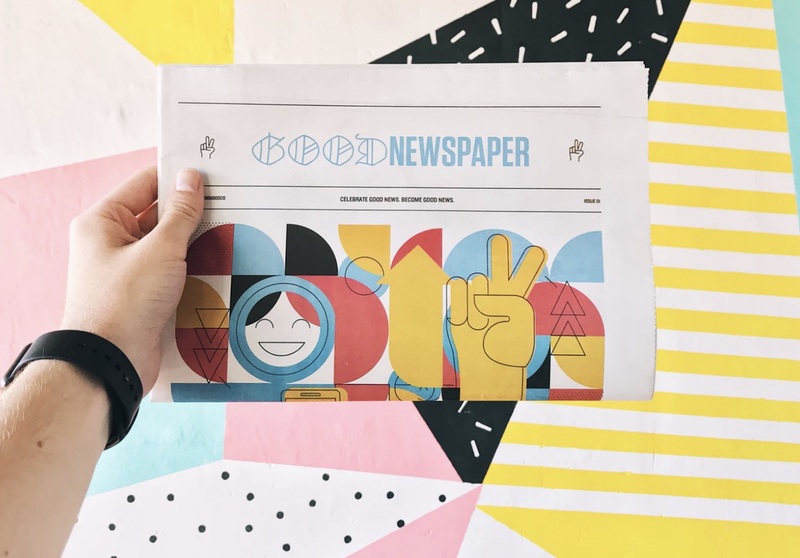 Use the five “W” questions (Why, when, what, who, where) and answers to give your newsletter a news tone: who, what, when, where, and why or how. Articles include all five of these questions and answers. Make it readable. Use short, to the point, and easy-to-understand language. Avoid complicated words and jargon. Make sure your newsletter reflects your ward ethos / philosophy / unique personality. Remember your patients come from different walks of life, have different values, beliefs, cultures, and have different levels of understanding and cognitive ability. Use interesting, snappy, fun headlines to evoke curiosity. Proofread. Don’t rely on spelling and grammar check tools. 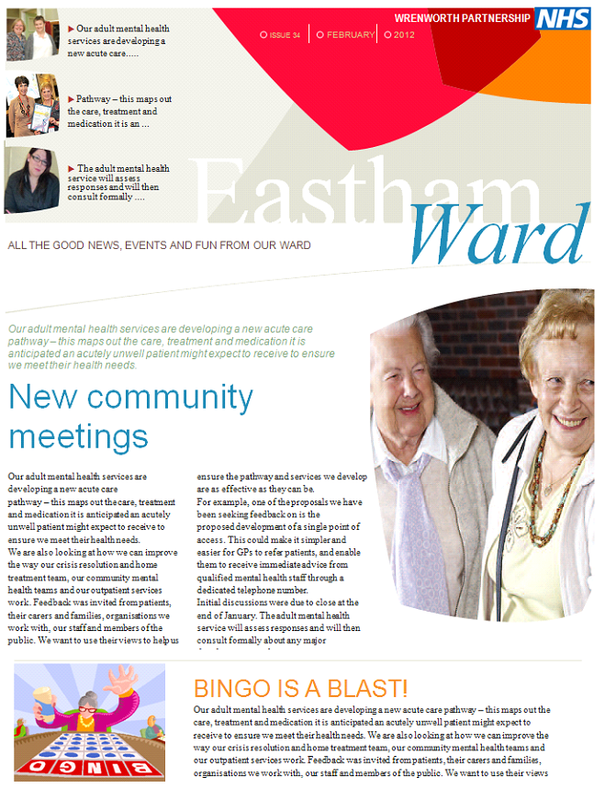 Weekly newsletters are put together with patients in a ward-based activity group. A white board is displayed in the lounge to gather ideas for features. Features: poems, raps, articles, thoughts, quotes, word searches and quizzes. Newsletter ethos: the content needs to reflect creativity and positivity, so nothing judgmental or negative or hostile. A particularly artistic patient creates hilarious comic strips. Patients use computers to write articles. Monthly news letter – include changes on the ward and what’s happening in coming month. Another idea which was client led was the monthly News4U newspaper. It was felt that there was a lack of communication between everyone at what was going on at the hospital. Achievements were not being recognised and no one knew what each other had been up to. The paper started as a team of two clients but soon nearly all the clients were contributing a page each to the paper. The paper contains information such as; what Education certificates have been awarded during that month, new clients that have joined us, clients who are moving on, clients pre-vocational adverts (e.g. advertising cards that they make for sale), sports, history and geography pages, puzzles and word searches and one month we even have a page dedicated to Klingon language! The paper is placed on every unit, in our library and a copy in reception. It has allowed clients to support each other in their achievements and to feel proud of steps they are taking in their recovery. Bevan Ward Tells the Truth!!! Bevan Ward PICU has been publishing a weekly Service User led newsletter, ‘The Bevan Ward Truth’ since January 2006. Service users chose the name and it is produced in a weekly group where the service users and staff on the ward contribute songs, poems, points of view and summaries of current news stories or health issues and a weekly quiz. They can choose to have their names printed or remain anonymous. The Service Users format and print the newsletter on the ward computers and it is then photocopied and distributed to all the wards in the City and Hackney Centre for Mental Health. The newsletter has had very positive feedback not only from those Service Users who publish the newsletter but also from staff on the ward and Service Users from other wards – some even delivering their quiz answers to Bevan ward!! The ward manager started the newsletter with support from two charge nurses. “It is an excellent thing for patients to have the opportunity to encourage their creativity. It also increases patient empowerment and promotes cohesiveness and co-operation between the patients on the ward.”One Service User fed back “I enjoy being part of the newsletter, where being creative is part of my day to day living as I have a design and art background”. Another added “It’s something we can all be proud of”.The OT aims behind the newsletter is to engage all the service users on the ward at whatever functional level they are at and empower them by giving them a voice to express their opinions and feel proud of the achievement of the finished newsletter. Through publishing our poems, stories, raps or song lyrics, we hope to promote a positive view, make people think, inform and educate them on current issues and test their knowledge in the weekly quiz!We want to publish a newsletter, which gives us the credit for the people we are. …. creative, intelligent, original, inspiring and who have a lot to say!!! If you are starting a ward newsletter for the first time, you may need some help and guidance on how to go about creating it. Fortunately, there are many places online where you can download newsletter samples and templates. These can help with the task and give you an overview of how you should set up your newsletter.